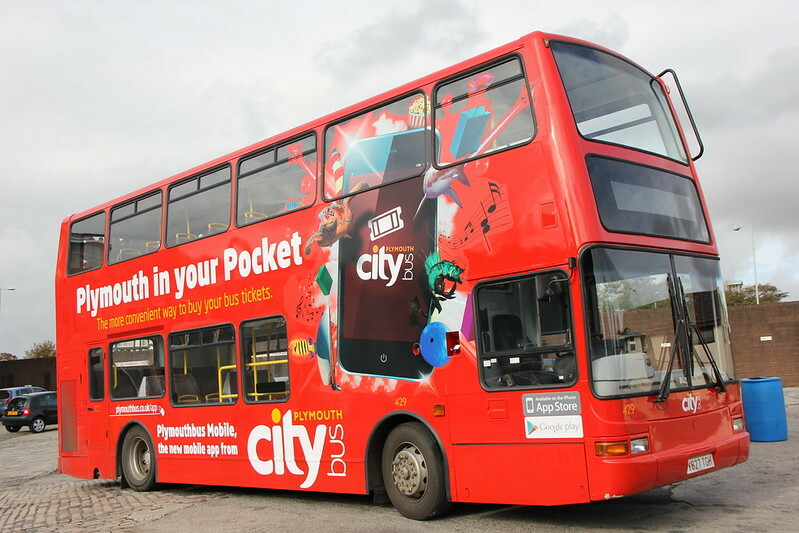 Plymouth Citybus 429 has finally received the full advert for the Citybus mobile app. Very smart indeed! I must admit I have downloaded the app and found it very useful. I dont need it for myself but have a couple of dayrider tickets stored up for when I take my son into town etc. I do like the fact that the tickets last for 24 hours rather than a set date as before. By careful timing I was able to use my last one for the school ruin on a Friday afternoon and then for a trip into town on the Saturday. Saved a few pennies on the normal fares. It does seem odd though just showing the bus driver the phone and not having to do anything else! On the offside the window that is covered completely is the one at the top of the stairs - no seats. On the nearside the rear backward facing seats have this on the window. Leaves around 57 seats with a clear view as I see it. Saw it on the 119 yesterday - looked fantastic. I like the bodywork of these deckers, but hate the insides, very basic, old & leaks water, certainly when you compare it to a B7. is that abit of kerb damage on the divers side already? The livery lends itself well to advertising! Looks brilliant and eye catching. I must admit with anonymous I prefer the East Lancs B7's over the Plaxtons.